Holidaymakers concerned about fresh volcanic eruptions causing flight-disrupting ash clouds might be reassured by a study setting out the first reliable estimates of their frequency. While the University of Leeds-led research suggests that ash clouds are more common over northern Europe than previously thought, it puts the average gap between them at about 44 years. It also reveals that these types of ash clouds have about a 20 per cent chance of occurring in northern Europe in any one decade. Lead author Dr Liz Watson, from the School of Geography at Leeds, said: "Reliable estimates of the frequency of volcanic ash events could help airlines, insurance companies and the travelling public mitigate the economic losses and disruption caused by ash clouds in the future." 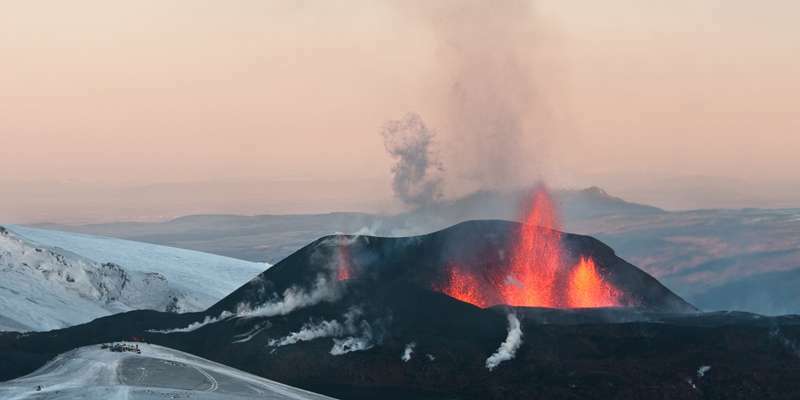 The work began soon after 2010's explosive eruption of Icelandic volcano Eyjafjallajökull, which caused more than 10 million air passengers to be stranded and cost the European economy an estimated £4 billion. A team of researchers, which included academics from the universities of St Andrews and South Florida, compared records of volcanic ash fallout (also known as tephra) during the last 1,000 years. Focusing on northern Europe which is downwind of Iceland, one of the world's most active volcanic regions, they examined samples taken from peatlands and lake beds in mainland northern Europe, Great Britain, Ireland and the Faroe Islands, alongside previously existing samples taken from other sites across northern Europe. The samples – cores up to seven metres long – were taken from peat and lake sediment where geological records are particularly well preserved. Using electron microscopy and chemical analysis, the team identified tiny shards of preserved volcanic ash, called cryptotephra - about the width of a human hair - which enabled them to pinpoint at what point volcanic ash clouds had spread across the continent. For many of the occurrences, the researchers were also able to match sample data to historical records or to existing geological data which charted specific eruptions. The work found evidence of 84 ash clouds during the last 7,000 years, most of which could be traced to eruptions from Icelandic volcanoes. More incidences of volcanic ash are recorded over the past 1,000 years, because evidence is better preserved and historical records are more complete, leading the team to estimate an average recurrence of 44 years. Co-author Dr Graeme Swindles is Associate Professor of Earth System Dynamics in the School of Earth and Environment at Leeds. He said: "In 2010, when Eyjafjallajökull erupted, people were really shocked – it seemed to come completely out of the blue, but the eruption of Grímsvötn, the following year, was an extraordinary coincidence. "Although it is possible that ash clouds can occur on an annual basis, the average return interval for the last 1,000 years is around 44 years. "The last time volcanic ash clouds affected northern Europe before the recent event was in 1947, 69 years ago – but aviation was much less intense at that time and it simply didn't have the same sort of impact. "Our research shows that, over thousands of years, these sorts of incidents are not that rare – but people wondering how likely it is that the 2010 chaos will be repeated in the next few years can feel somewhat reassured." The researchers also looked at the intensity of the eruptions responsible for producing volcanic ash clouds. They found that volcanic activity likely to produce ashfall in northern Europe would typically measure four or above on the internationally-recognised Volcanic Explosivity Index (VEI). "Eruptions can't always be indexed rapidly," explained co-author Dr Ivan Savov, also of Leeds' School of Earth and Environment. "But in cases where that calculation can be made early on, it will give a good indication of the likelihood of volcanic ash causing a major problem. "The 2010 eruption cost billions in terms of lost revenues and there was an effect on the global economy, so the work we've been able to do to quantify the risk will be of interest to insurance companies trying to make sense of the potential for future air traffic disruptions."